Detox Resolution Recipe Series: Using whole grains, vegetables, lean meats and healthier fats in recipes you may find taste really good! When I’m craving fresh tomatoes in January, I often turn to this recipe. Baking or roasting transforms the January tomato; minimizing the mealy texture and maximizing the tomato’s natural sweetness. A gratin is generally considered to be a baked dish topped with breadcrumbs or breadcrumbs and cheese. A gratin baking dish is a shallow, oval dish, and quite important to the success of the best gratins. My gratin dish is missing in action so I used a shallow, oval lid that tops a glass casserole and it worked quite well. This, and a dish of Mediterranean olives selected from the Whole Foods olive bar, was the only thing my husband and I had for dinner and we relished the simple meal. I generally serve this as a side dish, however, and it amply serves four. Brush a 9-inch gratin dish or shallow oven proof casserole with 1 tablespoon of the olive oil. 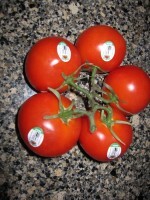 Arrange tomato slices in dish, overlapping if necessary. Season with kosher salt and freshly ground pepper. Evenly sprinkle basil over tomatoes. In a small sauté pan, heat remaining oil over low heat. Add garlic and sauté until fragrant, about 2 minutes. Remove from heat and stir in panko or bread crumbs and asiago. 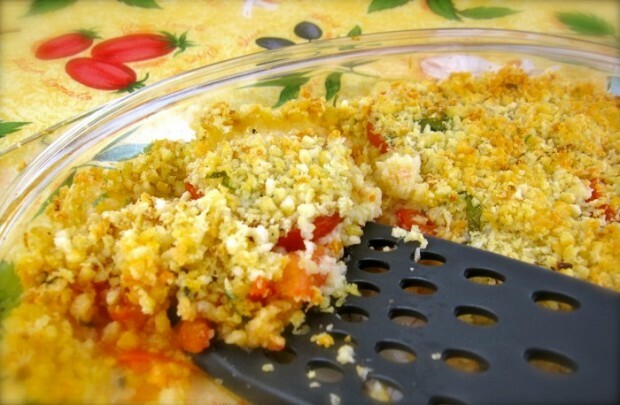 Sprinkle seasoned panko or bread crumbs over tomatoes. Bake on middle rack of oven until crumbs are golden, about 15 minutes.